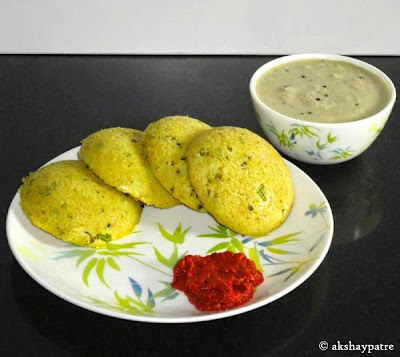 Oats idli recipe - Oats idli is a very healthy, nutritious and delicious breakfast dish. Adding some more health to the body and system by eating dishes made with oats is really a great idea for health lovers. Oats are very popular for its nutrition and health benefits. People who lead sedentary lifestyle must eat low fat, low calorie oats dishes. Oats are rich sources of soluble fibers. The soluble fibers and beta-glucans, help to lower the total cholesterol levels in the body. Eating oats help to keep the digestive system healthy as well. After eating oats dishes, there will be a feeling of fullness and it stops cravings. Therefore, it is recommended to include oats in the diet and eat them in any form or prepare your favorite dishes from it. I use both quaker oats and binda valley natural organic rolled oats, which are available in the Indian grocery store. For a change you can substitute regular rice idly with oats idli. Heat a pan and roast the oats until crisp. Remove and allow it to cool. When it cools, blend it to a coarse powder. In the same pan, add the rava and roast till the raw smell goes. Allow it to cool. Combine together the fresh green peas, green chilies, ginger, coriander leaves, turmeric powder and baking soda. In a small pan, make a tadka of mustard seeds, curry laves, hing and jeera. Pour this tadka over the green peas mixture and mix well. Now add rava, yogurt and salt to it. Add 1/4 cup of water and make a thick idli batter. Serve the oats idli hot with chutney. 1. Heat a pan and roast the oats until crisp. Remove and allow it to cool. When it cools, blend it to a coarse powder. 2. In the same pan, add the rava and roast till the raw smell goes. Allow it to cool. 3. Combine together the fresh green peas, green chilies, ginger, coriander leaves, turmeric powder and baking soda. 4. In a small pan, make a tadka of mustard seeds, curry laves, hing and jeera. Pour this tadka over the green peas mixture and mix well. 5. 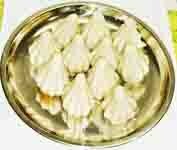 Now add rava, yogurt and salt to it. Add 1/4 cup of water and make a thick idli batter. 8. Serve the oats idli hot with chutney. healthy breakfast, perfectly made. Nice presentation. Love this yummy and healthy idli dear. Looks absolutely delicious. Healthy and filling idlis. Wonderful breakfast. They have come out so well.. I'm always looking out for recipes using Oats. Looks absolutely healthy. Will try for sure. Thanks Vidya.